I’ve been given a special gift this week, made all the more precious because it was unexpected, a still frame in the blur of life. For months, I knew I was coming up to care for mum for a week while my dad took a much needed break. But my focus was on finding childcare (my gorgeous aunt-in-law came over from Uganda to help us out!!! ), school pick ups (thank you Brid! ), and making meals for every night so Aunt Judith didn’t have to cook as well as looking after three young tearaways and change her first nappies at the age of 60+. So when I arrived it was in the tailspin of planning, packing, and panicking. You do suddenly panick as you run out the door leaving three small children in the hands of a woman who has never had kids – my worry being for her, I hasten to add, not them! But as squeals of delight greeted me down the phone every day, I began to relax into the week with my mum. When my mum had her stroke 19 months ago, I never thought I’d enjoy my time with her again. She was a shadow. And I was scared of her strangeness. But this week was almost like days of old. I did her hair and make-up every day, and we laughed. Really laughed. She has made so much improvement, that at times I forgot the fear, and enjoyed the fun. For the four hours a day that she is in a wheelchair, I took her out to the amazing Titanic Exhibition, to the shopping centre, and round the park in the sun. Her friends came round for lunch and stayed all afternoon. We watched and sang to the Sound of Music, and we went through old photos. She still can’t remember people or names, but she engaged none the less. Every morning, I brought a little table in beside her bed, and worked beside her on my laptop, chatting and drinking tea. And in the evenings, I would hop up on her bed and lie beside her while we watched TV. 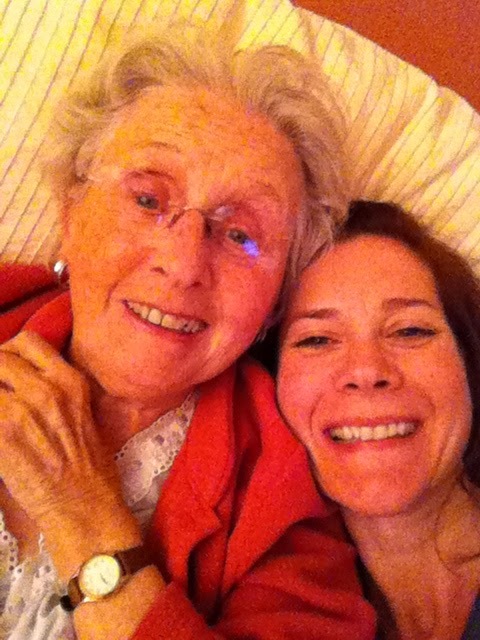 For a week, I’ve had my mum back…….. one of the most precious gifts I’ve ever had. Oh Alana, I have tears streaming down my face. This post made me so happy. I just love that photo of you and your gorgeous Mama. What a wonderful week for you both to share… so long overdue and so incredibly important. I hope you can have many more weeks like this in the future, but you'll always have the one you've just spent together, so lovely. I'm so happy that your mom is improving! Fantastic news and so happy to hear that your week together was all you hoped for and more!